"I don't know the name of that fear, but I know I've got it. It's the fear of the unknown." I didn't have very high expectations for this book. First of all, I usually don't enjoy books about fairies or pixies. They're usually a little too "out there" for me. 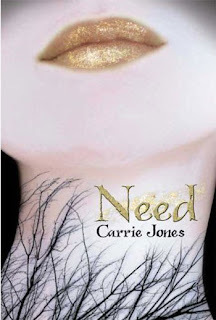 I hadn't heard anything phenomenal about this book, but I was pleasantly surprised by how much I enjoyed Need. The writing was good quality. Jones is a very descriptive writer, and I loved her portrayals of the supernatural pixies and weres. The story wasn't that impressive, but the writing itself was wonderful. There is a good balance of humor and gravity, which makes for an entertaining read. Zara is a very likable, if sarcastic, character. In the beginning, Zara is just another new girl in a small town high school. As the story progresses, Zara emerges from her depression and becomes a very admirable and relatable character. While I liked Zara, some of the other characters seemed a bit flat, especially her love interest. Still, they were interesting enough to keep me reading. Parts of the novel were fairly predictable, but I was entertained throughout it all. At times, it was quite thrilling. Rethink everything you've ever known about pixies- they aren't little fairies who live in forest houses. I enjoyed this new representation of the fairy-like creatures. Although other aspects of the story weren't very original, the creepy pixies added a unique feel to the novel. I can honestly say that this is a book I will be recommending to others. Cute yet exciting, Need is everything I look for in a story about fairies. It's a good fun read huh?